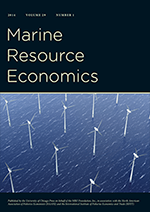 Environmental Economics: Backdooring climate policy? More than two thirds of the world's polar bears will be wiped out by 2050, according to a shocking new study. By then, scientists say, global warming will have melted 42 per cent of the Arctic sea ice which the bears need to hunt and breed...The scientists have publicised their findings in the hope of influencing U.S. Interior Secretary Dirk Kempthorne, who has been asked to put polar bears on the U.S. endangered species list. Listing on the endangered species act would require the U.S. Fish and Wildlife service to develop a recovery plan specifying the specific steps and costs required for recovery of the species. The recovery plan includes the designation of critical habitat and conservation plans for that habitat. So if you follow the bouncing ball of bureaucratic logic: Global warming causes ice melt...ice melt cause polar bear population declines...polar bear population declines lead to listing on the endangered species list...listing on the endangered species list requires a plan for species recovery and habitat conservation...species recovery and habitat conservation requires reversing global warming...reversing global warming requires climate change policy. Alright, I'll ask: Suppose, just suppose, the current warming trend is part of a natural warming trend and not man-made--I'm just supposing, not claiming--does listing polar bears as endangered then require a habitat conservation plan to reverse nature's intentions? Just supposing.